Today’s post is our first visit to a recent book by a UK analyst with whom you might be familiar – How to Pick Quality Shares by Phil Oakley. 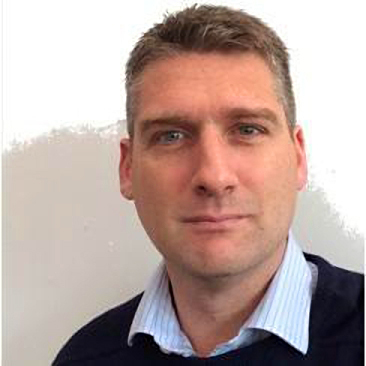 Phil Oakley is an investment analyst and private investor. He works for ShareScope, which is part of Ionic Information (along with the portable version of the software, called SharePad). ShareScope is a software and data solution for analysing companies, aimed at private investors. Phil publishes regular tutorial articles showing you how to get the best out of the software (they are useful to non-users also). Before that, Phil spent 13 years as an investment analyst, leaving the City in 2009. He worked for MoneyWeek before joining ShareScope in 2012. He has the Chartered Institute of Securities & Investment Diploma and the Certificate in Private Client Investment Advice & Management. And now he’s written a book. The book has lots of real-life examples, mostly from the UK, with Domino’s Pizza being the main one. This is a quality business that has shown great returns over many years. Phil warns against using the system on banks or insurance companies – it’s strictly for non-financial firms. And it’s not a “get rich quick” scheme. It’s a long-term process, perhaps for the rest of your life. Phil is a firm believer that amateurs can beat the professionals. Like me, he thinks that you should become a DIY investor. And, of course, that means that you need to know your way around a P&L (income statement), a balance sheet and a cash flow statement. Phil recommends a concentrated portfolio of 10 to 15 stocks. And a minimum of £3K per firm, meaning you need £30K to get started. For me, this needs some context. £30K is plenty to get a portfolio of the ground. But you shouldn’t put your entire wealth into an actively managed portfolio of UK stocks. In fact, it’s unlikely that such a portfolio should ever make up more than 30% of your net worth. And you need some wealth in safer places before you start allocating to active shares. I would suggest about £80K before you put the next £20K into stocks. Phil is particularly keen on cash flow, so we’ll come back to that in the next article. For today, we’ll look at Profits and Return on Capital. Profits (also known as income or earnings) are derived from sales (also called turnover or revenue). So the first thing Phil looks for is a company that has been selling more each year. A company whose sales go up is growing, and can be called a growth company (depending on some minimum rate of growth). This is a good and reliable number to use to compare companies, and years. It also has the advantage that interest (from debt) and tax (on profits) are not included. This is similar to operating profit, but includes the companies share of profits from associates and joint ventures (businesses now wholly owned by the company). EBIT is Phil’s favourite profit number, and we’ll come back to why that is in a moment. A lot of analysts and media commentators use this number, but Phil prefers EBIT. The current rate of UK Corporation tax is 19%. This can be adjusted to reflect profits made outside the UK, but also because certain expenses are not tax-deductible. Other expenses receive a more favourable than usual treatment. Domino’s effective rate for 2015 was 18.96%, below the 20% rate at the time. The variation in effective tax rates means that PAT is not very useful in comparing companies. To Phil, this means that a rising EPS doesn’t mean a good company, but to shorter-term / momentum style investors, share-buybacks and a rising EPS would be a positive sign. Phil also recommends that you look at fully diluted EPS, which adds back future shares from options and convertible debt. He uses two friends (John and Bob) who are landlords to illustrate. Each buys a house worth £100K, but John uses cash, whereas Bob uses a £5K deposit and a 95% loan (mortgage). The loan costs 5% pa in interest. They each manage somehow to find a tenant willing to pay £10K a year in rent. That’s a 10% yield, which would be enough to tempt even me into buy-to-let. And to simplify the example even further, Phil assumes that this is £10K of net rent, after the expenses of running the properties. John has made more cash than Bob, since he only has to pay 20% tax on his earnings, while Bob needs to repay the interest. But Bob thinks he’s done better since his return on equity (he only has £5K of his own money in the house) is 84% compared to only 8% for John. 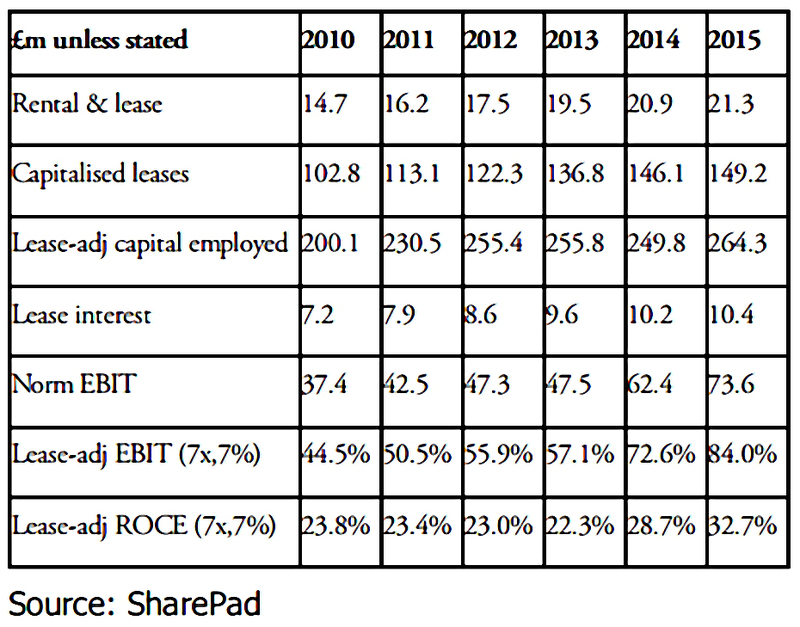 The return on assets for both of them is 10%, since this is based on EBIT. Phil says that although debts and taxes matter a lot in other contexts, they can make it more difficult to identify a good business. So he sticks with EBIT, and looks for EBIT growth that is larger than revenue growth. 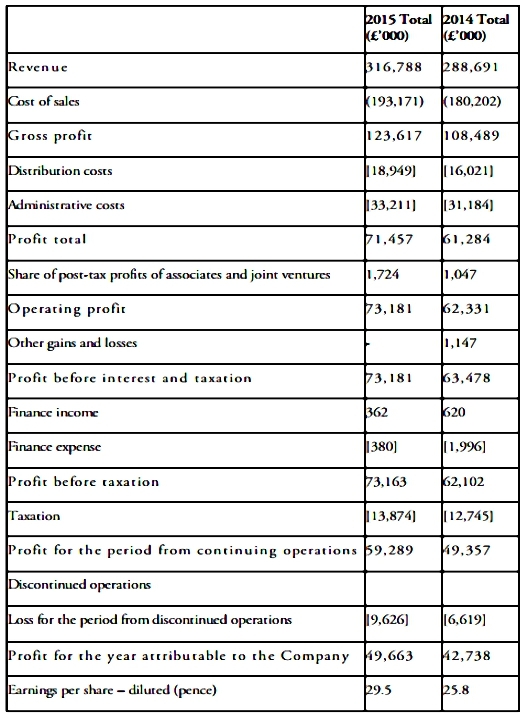 All of these profit calculations come from the company’s income statement (formerly known and the profit and loss – P&L – statement). Phil provides the statement from Domino’s for 2015 as an example. 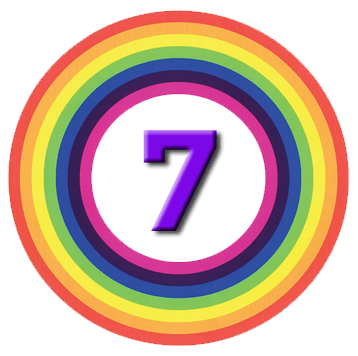 Negative numbers appear in brackets – this is an accounting convention, as you may have noticed from the formatting options in whichever flavour of spreadsheet you favour. 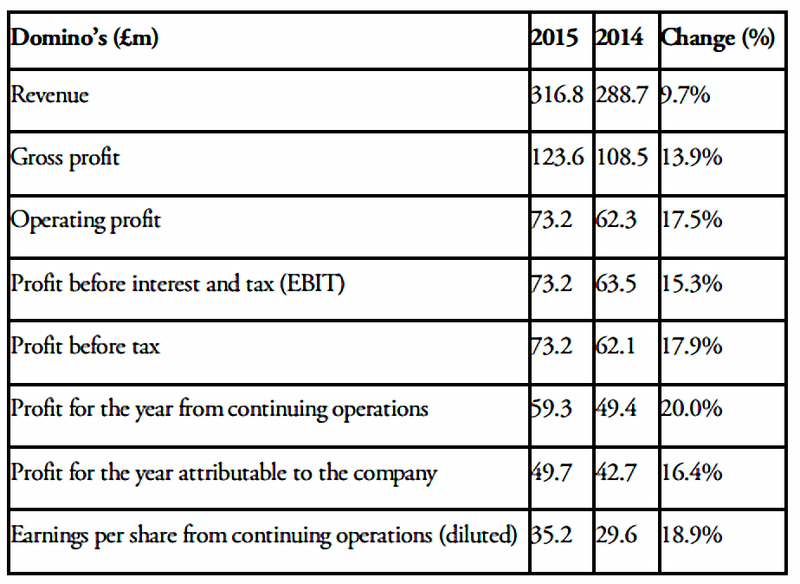 Phil looks for the increase in profits to be larger than the increase in revenues (which was 9.7%). This is the case for Domino’s, across all six measures. Phil recommends a ten-year EBIT view as the best profit indicator. Phil includes sales along with EBIT, since he wants to see sales growing. 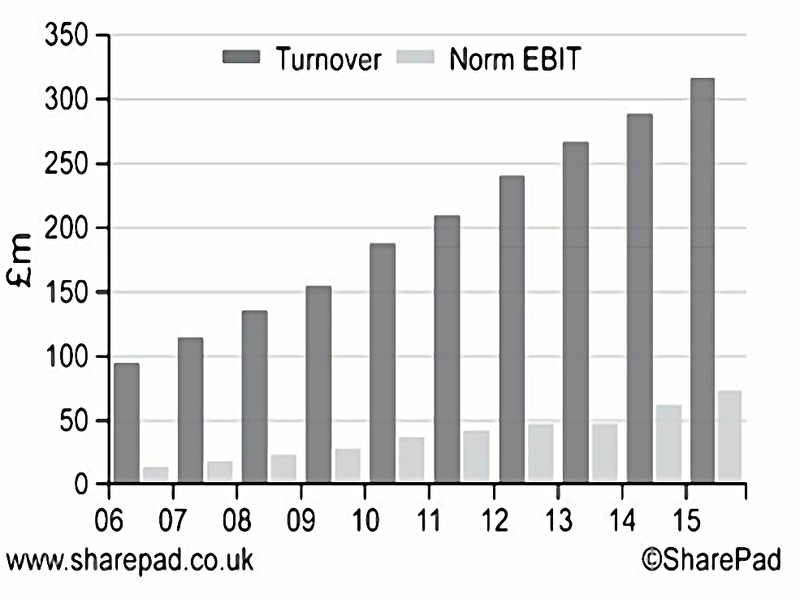 But I think that without a second vertical axis, this makes the growth in EBIT harder to see. 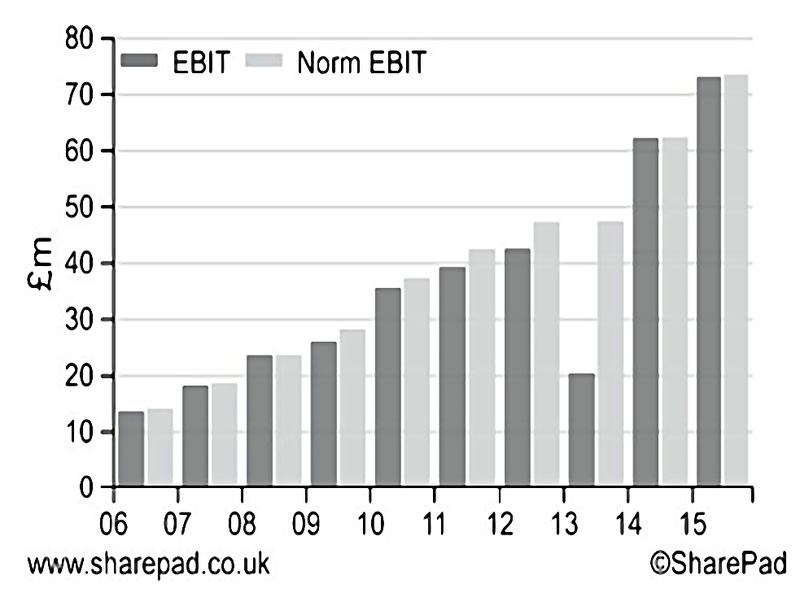 Note that Phil’s chart used “normalised EBIT”, which strips out “exceptional items” – one-off gains and / or costs. You should be wary of companies which have regular one-off expenses and where normalised EBIT is always significantly higher than total EBIT. This is telling you that these costs are not really one-offs, but regular. This can be a sign of aggressive accounting and is often a signal to steer well clear of a company. Phil sees high margins as combining quality and safety. He looks for a margin of 10% to 15%, consistent over time. Phil doesn’t attach too much significance to sectors, but rather simply looks for high margins. Phil wants to know how much a company spent to produce its sales and profits. Usually companies need to invest in new assets that support increased production. Sometimes, companies grow by buying other companies. Either way, as investors we need to understand if the company is getting a good return on what it spends. I’m guessing Phil’s term is at some level intended to conjure up a comparison to the returns available from bank accounts. Despite this, he makes it clear that he’s referring to the returns earned by the company, rather than by the investor. the money spent, which also totals to £100K. Domino’s suppliers are owed £52.91m at the end of 2015. The way to get around this is to average the figures from two years (in this case from 2015 and 2014). There has been a relative crash, and a recovery. 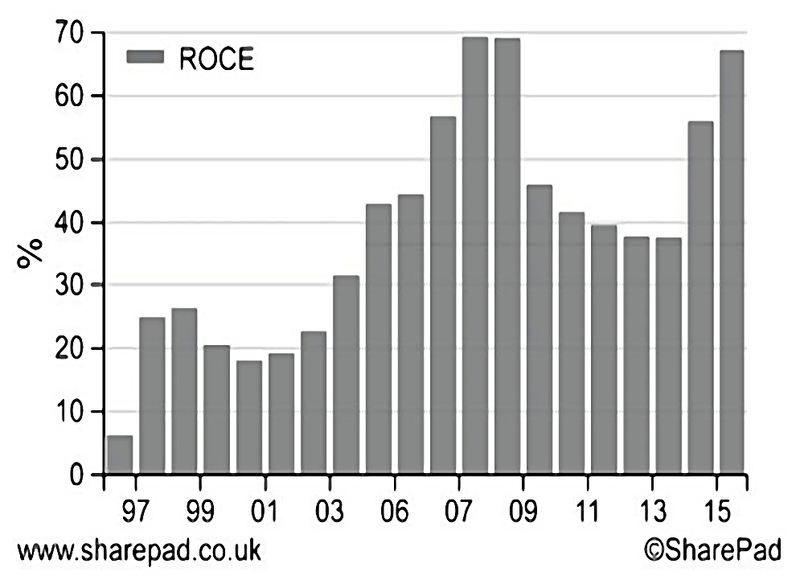 But ROCE has been above 20% for 17 of the last 20 years. This is then added to the capital employed: £115.1M + £149.1M = £264.2M. Assuming an interest rate of 7% gives interest on the £149.1M of capital of £10.4M. 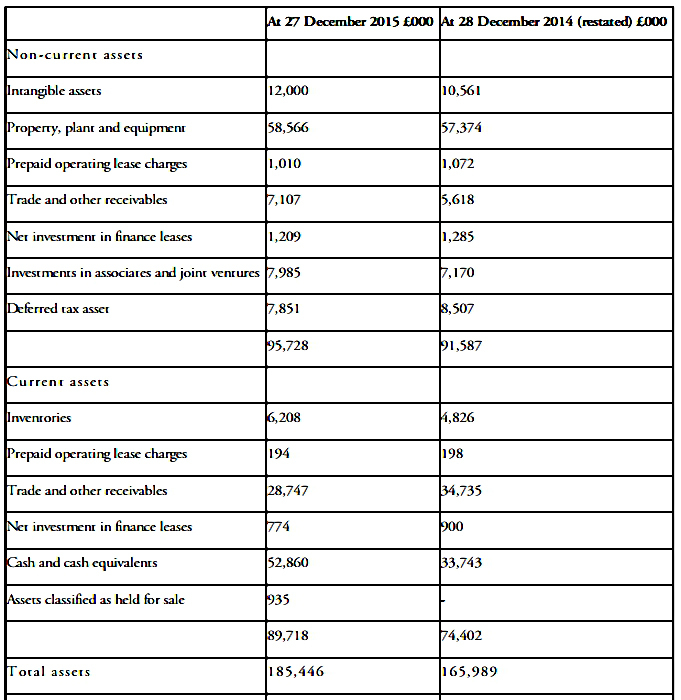 So the lease-adjusted EBIT is now £73.6M + £10.4M = £84M. 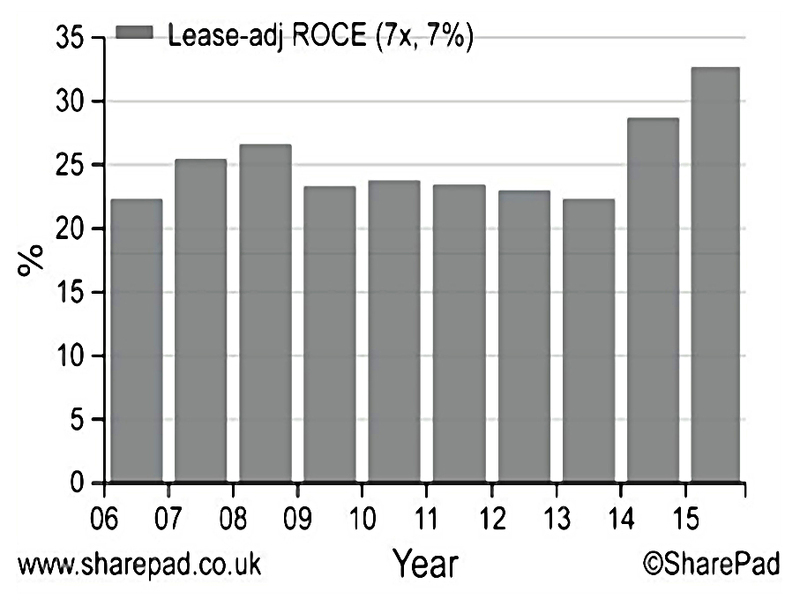 For 2014, rentals are £20.9M. Multiply that by 7 to get £146.1M. 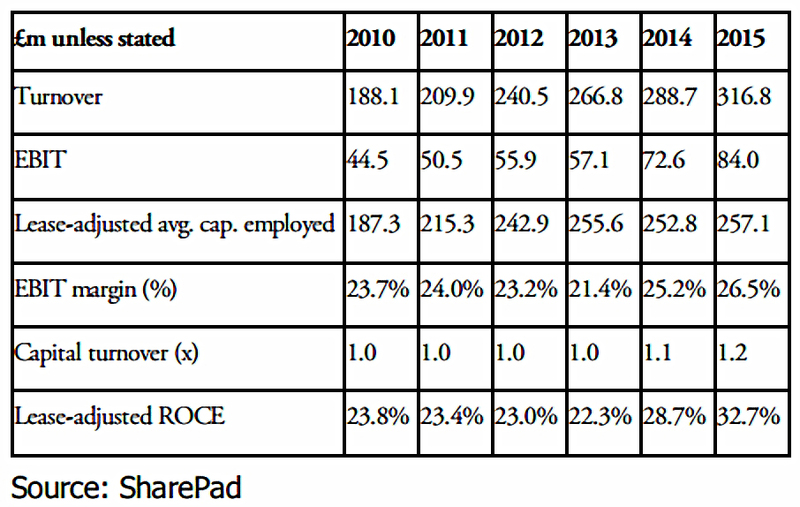 Phil provides a table of adjusted ROCE for the previous six years and a chart for the previous 10 years. DuPont analysis was invented by Donaldson Brown in 1919 (when he was working for DuPont). It attempts to explain how a company makes its profits, breaking out the impact of margins and sales relative to capital. It should also indicate how sustainable profits are, and whether they will improve or get worse in the future. High-quality companies grow by selling more (increased volume), rather than raising prices. Higher prices and flat sales indicate trouble ahead. Fluctuating profit margins indicate a cyclical business (with sales linked to the economic cycle) or possibly high operational gearing. These are risky stocks not suitable for the long-term. So Phil looks for stable profit margins. 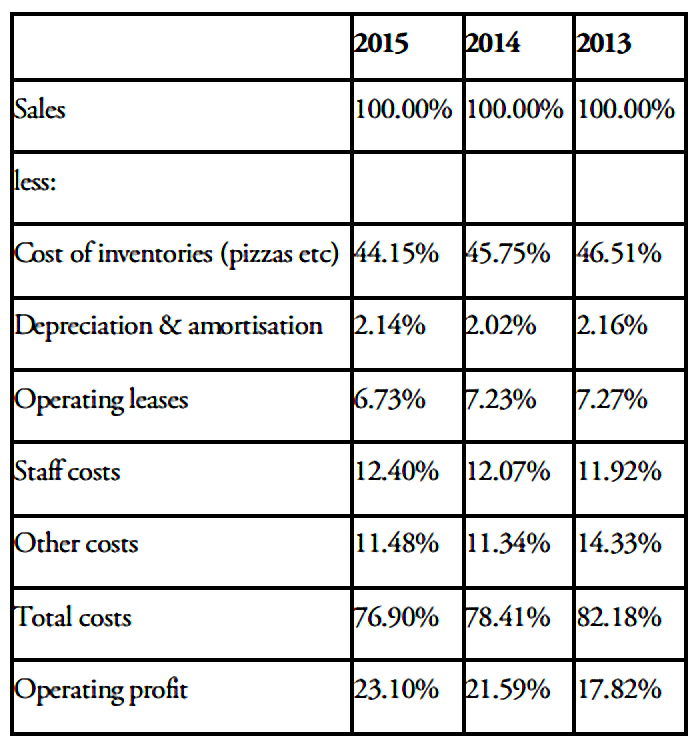 As before, Phil provides a 6-yr table and a 10-year chart of this analysis for Domino’s. I can’t say that I find the chart the clearest. 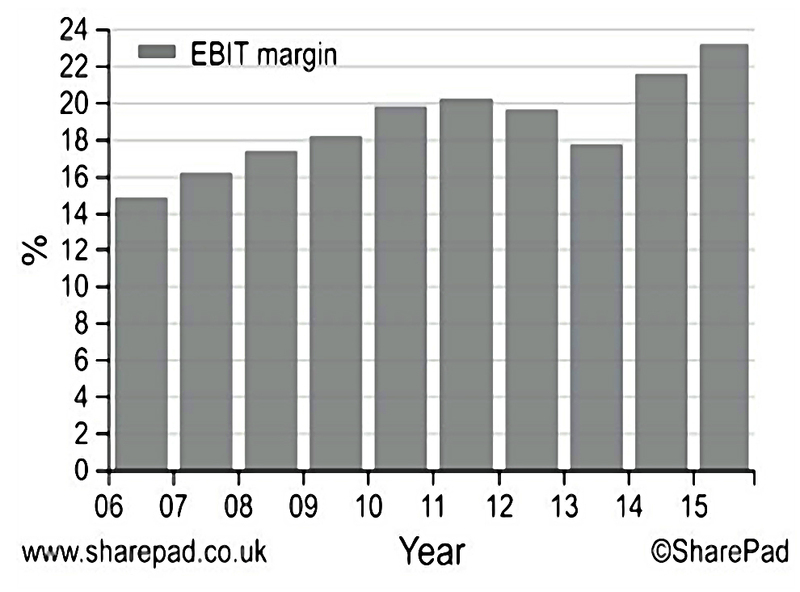 There is a discernable trend for profit margin to mostly increase (apart from 2012-13). 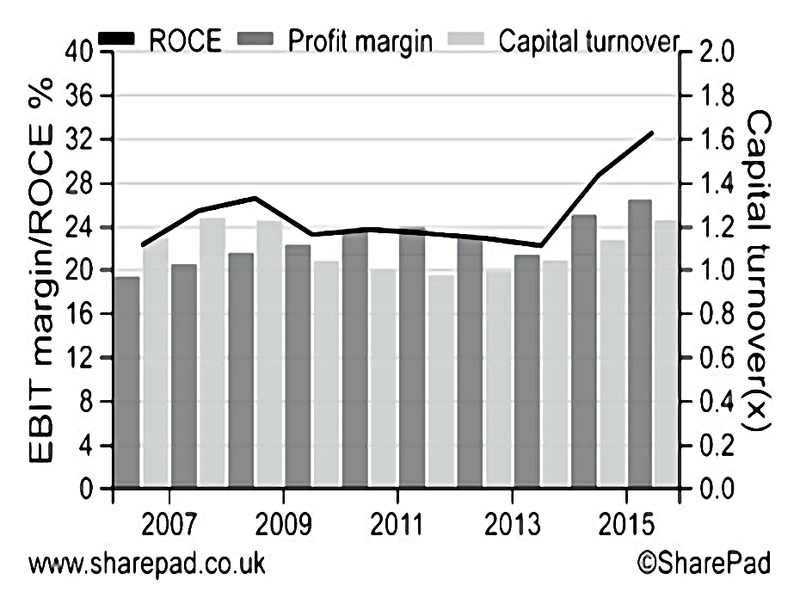 Whilst capital turnover rises then falls, before recovering. To investigate further, Phil looks at 2013 to 2015. He concludes that profit margins have had a bigger effect than capital turnover. This seems a relatively small effect to me. Next he drills into profit margins, by looking at sales and expenses. 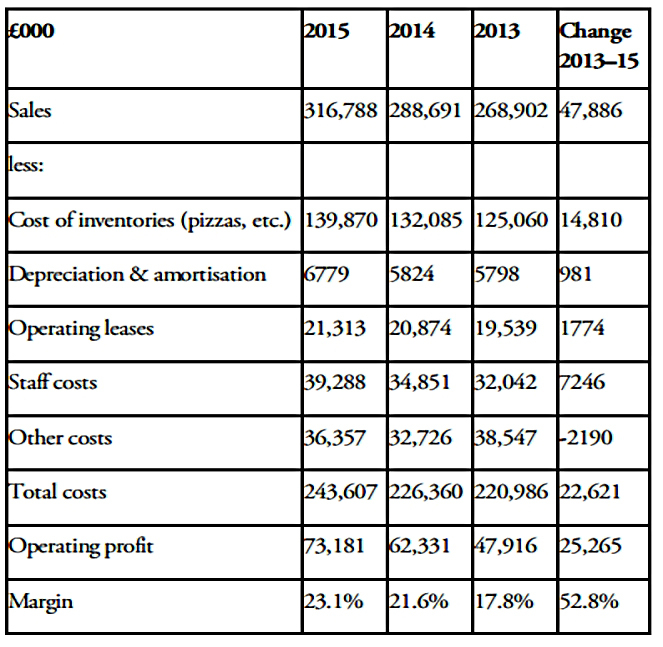 Domino’s has added £47.9M of sales from 2013 to 2015, but costs have increased by only £22.6M. So more than half its extra sales were turned into profit. Alternatively, a 17.8% increase in sales led to a 52.7% increase in profits. This is operational gearing in action, but we could have deduced that Domino’s would be such a company. Inventories (ingredients) have fallen by 2.36% of sales. And “other” costs are down from 14.3% of sales to 11.5%. Margins are up because costs are down compared to sales. Next, Phil turns to the company report, which confirms positive operational gearing and lower ingredient costs. So the increase in margins might reverse if food costs increased. Buying power with suppliers has increased, which is obviously good. Phil recommends that you compare the companies comments with the opinion you have formed from your own analysis. Try to invest in companies where these match (and are positive). This is a good – and dense – book, with lots to take in. 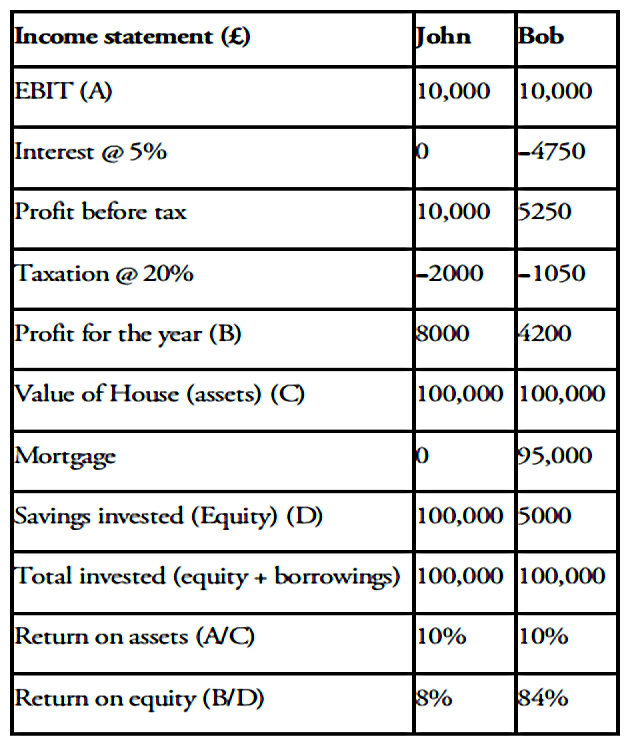 I was impressed with the section on profits, and why EBIT is the most useful of the six available options. I also like the part about profit margins, and in particular the lease-adjusted margin calculations. The most frustrating section so far has been the DuPont analysis, which sounded so promising in theory but illuminated little in practice. Perhaps this is just because Domino’s is not a good candidate for this kind of approach. It seems likely to me that even a qualitative version of DuPont – looking at the likely changes in all the drivers of margins and capital turnover – would be useful in many cases. I’ll be back in a few weeks with the next couple of chapters in the book, which are about Free Cash Flow.